This poster presents some of the main findings in A discipline in disguise: a domain analytic approach to History of science and ideas through the subject representation in LIBRIS: bibliography included [Den dolda disciplinen: en domänanalytisk ansats i relation till Idé- och lärdomshistoria genom ämnesrepresentationen i LIBRIS: med bibliografi] (Alm and Larsson 2003). The thesis aimed at a deeper understanding of information systems and subject representation in relation to academic disciplines. 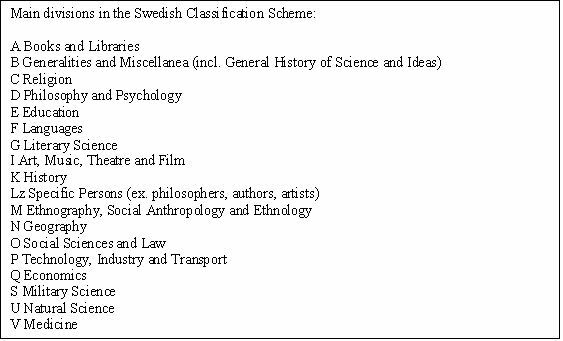 This was carried out by comparing how a discipline, the History of Science and Ideas, views itself, compared with the subject representation of its dissertations in the Swedish National Academic information system, LIBRIS. The theoretical point of departure for the thesis is Hjørland’s domain analysis which states that the quality of information seeking is enhanced if subject representation takes into account the contexts in which documents are produced and used (Hjørland 1997). The importance of concepts such as domain and discipline is discussed. The discipline of the History of Science and Idea’s view of itself was established in three ways; by studying articles written by its scholars, by examining how the discipline presents itself on the web sites of five university institutions and by examining the titles and keywords accorded to dissertations in the discipline. The information system’s representation of the discipline was investigated through the classification codes, subject headings and the index terms accorded to the relevant dissertations. This comparison was an attempt to discover possible discrepancies between the two representations (Alm and Larsson 2003). The study did not find any significant discrepancies between the two representations, as the subject representation confirmed the discipline’s view of itself as a discipline that studies the relations between man, society and nature. What it did find, however, was that the subject representation did not, to any greater extent, recognize the discipline as such, as there is little evidence of the context from which the dissertations originate (Alm and Larsson 2003). As we will see this has consequences for the retrieval of documents from the discipline, and is connected to some earlier issues identified in librarianship and information science. Lancaster defines retrievability as: ”How much of the literature on the topic, included in the database, can be found using ”reasonable” search strategies”(Lancaster 1998, s. 127). This is related to the difficulties faced by Alm & Larsson in trying to retrieve dissertations in the History of Science and Ideas using classification codes representing the chosen domain, a strategy which seemed 'reasonable', and furthermore was recommended by academic librarians. This resulted, however, in low recall, probably due to the recommendations issued regarding the application of classification codes. 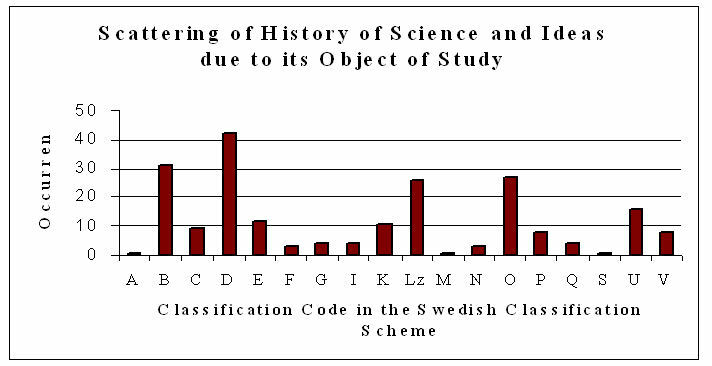 There appears to be a conflict between the Swedish Classification System, which states that the discipline of the History of Science and Ideas should be scattered in the system due to its object of study (Klassifikationssystem för svenska bibliotek 1997), and recommendations from the Swedish Royal Library, suggesting that the classification code should represent the discipline (Gustavsson 1999). Unfortunately it is not clearly defined if this means the discipline which is the origin of the document or the discipline which is the object of study in the document. As a result, Alm and Larsson did not succeed in collecting their empirical data through the information system, LIBRIS, but had to contact the relevant academic institutions to be able to find the requested dissertations needed for their work (Alm and Larsson 2003). This had probably not been the case if one had fully considered disciplines as entities in knowledge organization, and knowledge domains accordingly reflected as such in information systems, as suggested by Hjørland and Albrechtsen (Hjørland and Albrechtsen 1995;1999). Alm, M. & Larsson, J. (2003). A discipline in disguise: a domain analytic approach to History of science and ideas through the subject representation in LIBRIS: bibliography included [ Den dolda disciplinen: en domänanalytisk ansats i relation till Idé- och lärdomshistoria genom ämnesrepresentationen i LIBRIS: med bibliografi]. Borås, Sweden: Högskolan i Borås, Institutionen Bibliotekshögskolan. Hjørland, B. (1997). Information Seeking and Subject Representation: An Activity-Theoretical Approach to Information Science. Westport, CT: Greenwood Press. Hjørland, B. & Albrechtsen, H. (1995). Toward a New Horizon in Information Science: Domain-Analysis. Journal of the American Society for Information Science 46(6), 400-425. Hjørland, B. & Albrechtsen, H. (1999). An Analysis of Some Trends in Classification Research. Knowledge Organisation 26(3), 131-139. Klassifikationssystem för svenska bibliotek (1997). 7. ed. Lund, Sweden: Bibliotekstjänst. Lancaster F.W. (1998). Indexing and Abstracting in Theory and Practice. 2 ed. Champaign, Ill.: University of Illinois Graduate School of Library and Information Science Publications Office.